Once you have your flights booked, you want to score a good hotel deal. My 5 tricks to get the best hotel deals should help you out. Additionally, you’ll want to sign-up for the free Extreme Hotel Deals email and twitter alerts. Don’t expect daily deals, but a few times a month a really good hotel deal will land in your inbox. In many cases these will be ‘mistake’ rates which might not always be honoured by the hotel. Still, I had my fair share of extremely cheap hotel stays thanks to EHD, so it definitely worth the effort. Make a list of destinations than are an option for your travel partners. Always carry your credit cards, bank authentication device and passport details of your travel buddies. You might need them for the online booking. Activate email & social media alerts for updates of your favourite travel deals sites. 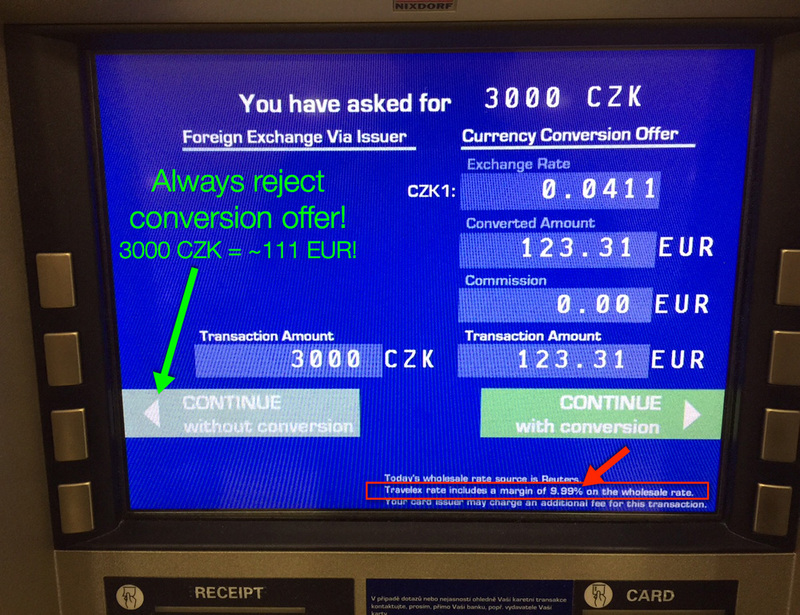 Some reminders to avoid common currency ‘scams’ when withdrawing money or paying bills abroad. Always pay in the local currency. Hotels, restaurants, shops and even ATM’s will ask you if you wish to pay in your home country currency. This is a SCAM. If you agree, the terminal will convert the foreign currency to your home country currency and apply a nice markup fee for the business owner. Don’t fall for it and ALWAYS insist to pay in the local currency. Find an ATM with no or low fees. On top of the fees charged by your credit card issuer, many ATM’s charge an additional fee to withdraw money. e.g. in Bangkok all ATM’s now charge a 220 THB fee. For other destinations it might help to google in advance to figure our which banks provide ATM’s with no fee or at least the lowest fee. Several years ago, a fellow economy class passenger introduced me to the Bose noise cancelling headphones. He handed over the headphones and said, “give it a try”. I’ve been hooked ever since. If there’s one piece of travel gear I can recommend to make your flights more enjoyable: noice cancelling headphones! You’ll be surprised how different the inflight experience is when you’re wearing noise cancelling headphones. The good ones aren’t cheap, but you’ll be convinced they were worth the investment after your first flight. I currently use the Bose QuietComfort 35 wireless headphones II. As most airlines now charge additional fees for checked luggage on short haul flights, it’s important to have a good carry-on suitcase. I’ve been using Samsonite luggage for the past couple of years and had the opportunity to test a number of models. Some of them I hated e.g. the expensive Lite-Cube Spinner. The wheels under this thing are so noisy… an embarrassment to walk through the airport with it! Luckily Samsonite has some really good products too. My favourite hand-luggage is the Samsonite Neopulse Spinner 55cm. It manages to cope with my weekly travels and offer maximum storage capacity. Check my video review below for more details. Hopefully you’ve already collected some valuable hotels points with your travels. If not, sign-up for your favourite hotel loyalty programs now and track your accounts via AwardWallet. Once you’ve collected some points, you probably wonder where you can use them and how to get maximum value out of them. You could login to each hotel loyalty program and search for free hotel night awards. But what if you could search all loyalty programs at once? You can! Both Pointimize and Hotel Hustle let you search for hotel award availability for the dates and location you provided. They also compare the ‘revenue’ (cash price) of your hotel night versus the number of points required. That way you know if you get good value for your points or not. Need inspiration on where you can stay with your hotel points? Try Awardmapper. Your Tips & Tricks for better travel in 2018? Hi Bart, thanks for the post. My question to you about booking hotels via cash back sites or other deals-websites is that, the hotel don’t give you their loyalty points for booking via third-party. So could you please explain how do you manage to get so many loyalty points? Hi Dave, thank for your feedback and question. Most hotel chains (e.g IHG with Crowne Plaza, Holiday Inn, InterContinental…) can be booked directly via cashback sites. So you’ll be earning both points and get cashback! On top of that you’re Elite level amenities will be honoured. Thanks for this awesome posting Bart! I consider myself somewhat savvy as it relates to travel, and am gearing up for my birthday trip to Europe (London-Paris-Brussels-Amsterdam), where I used SPG points to book all of my hotels for two weeks for my wife and I. Saved $4200!!! Anyway the cashback sites are new to me, so I will have to check them out. As always you leave me armed with some new travel tools to add to my arsenal. Happy Travels man! Thank you so much for sharing your succes story with SPG points Dre! I wish you & your wife a fantastic birthday trip to Europe! Hey Bart! You have compiled a very nice list here! I’ve been looking for the perfect city trip backpack but I don’t really get out of it… I’m currently using a Forclaz 22-AIR from Decathlon. What do you recommend? Hi Bart – Thanks for your great tips, I’ve been a follower for quite some time, always looking for an ‘angle’ 🙂 I now had a question on the booking of an award ticket via miles and bonus (Aegean airlines). I would like to book an intercontinental business class ticket but their website doesn’t allow to search for award tickets and I really want to make sure that I book the right type of ticket – any tips because they’re not really responsive… thanks!